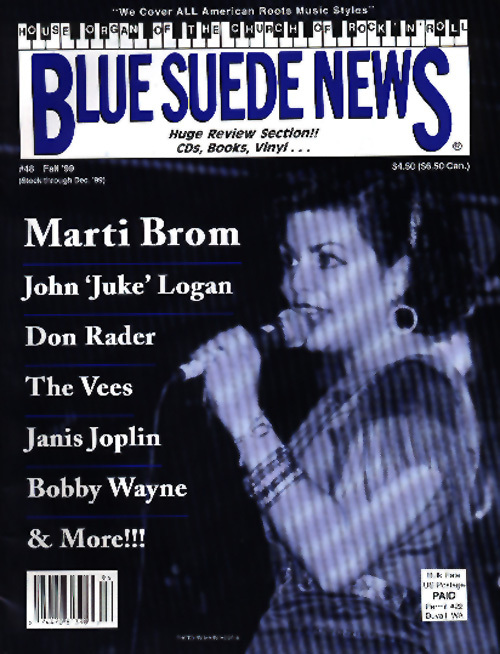 Blue Suede News #48: Marti Brom, Don Rader, Bobby Wayne, Janis Joplin, John 'Juke' Logan, The vees, Rockabilly, Blues, '50s Rock'n'Roll! Issue #48 - Fall 1999 - Scroll down to order!! Blue Suede News #48 (out of print, only available as a reprint with complete sets OR digitally!) has 68 pages with a slick cover. Featured is Marti Brom, a singer with a voice and looks of Patsy Cline and a whole lot of great songs. The story is titled Marti Brom brings the Hillbilly glamour back to Country and Rockabilly music. There is a story about obscure '50s Rockabilly singer Don Rader. The main feature is an interview with Bobby Wayne, a country and Rockabilly artist from the Northwest who has great stories to tell about working with famous musicians like Roy Drusky, Jerry Reed, Faron Young and others. Very interesting. There is also a story about Janis Joplin called Little Girl Lost ­ The Contemporary Search for Janis Joplin. A must read for fans. On the Blues side we get to read an inteview with John "Juke" Logan, a recording artist for Mocombo Records. He has worked for Albert Collins, Leon Russell, Ry Cooder and Los Lobos. Fans of contemporary Rockabilly will enjoy the story about The Vees, titled Crash Boom Banging it out in style. They are Bobby Vee's sons by the way. There is also a story about the roots music radio station WMNF and a fantastic photo layout with pictures taken at Jazz Fest in New Orleans, the Handy Awards in Memphis and the Chicago Blues Fest. Now out of print, we'll photocopy this issue only for those who order complete back issue sets, and only up until issue #52 goes out of print (30 copies left). After that the complete issue sets will include a CDR with digital versions of the out of print issues in pdf form. Issue #48 is now available digitally for $7.50! Issues #35 - #56 are available in pdf for $7.50. Send $8.00 (U.S. or Canada), or $11.00 (Outside the U.S. and Canada) and note which issue you're buying - to Blue Suede News, Box 25, Duvall, WA 98019-0025 U.S.A.